House History: My husband and I happened to come across our house while going to a yard sale. We drove past it daily for a couple of years and dreamed about what it might be like to live there - and then mentioned it to our realtor in passing. She started asking around and in the end, we asked the owners if they'd be willing to sell. They weren't interested at first but after a bit, it turned out that they were! The rest is history. Now we're living in that very ranch house and thankfully, it's just the way we pictured it. 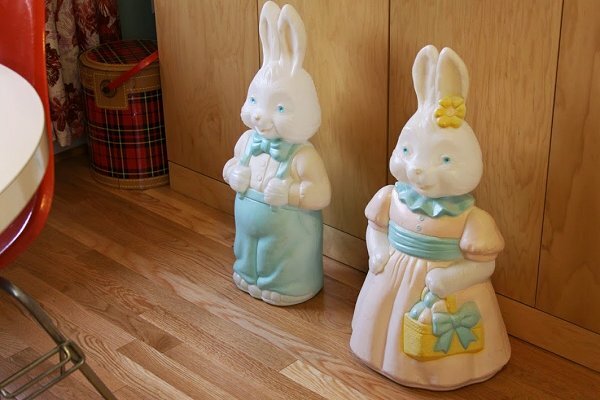 Define Your Style: I try to be very streamlined but epically fail due to my tendencies for grandma style and kitsch. And weird books and knick-knacks and old bottles of floor wax. Honestly, I couldn't stick to one era or style if I had to. 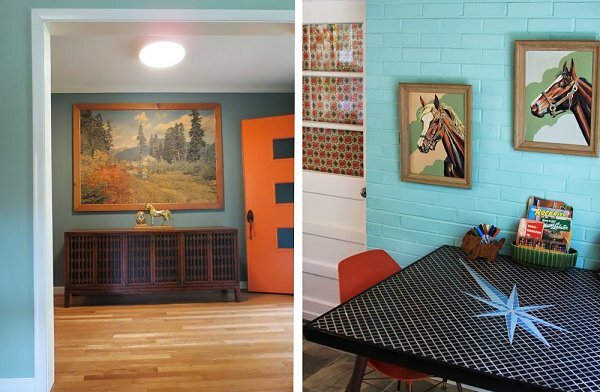 I love bright colors and anything that is vintage Western or wood grained. I'm a nut for knotty pine and am kind of a credenza and chair addict. 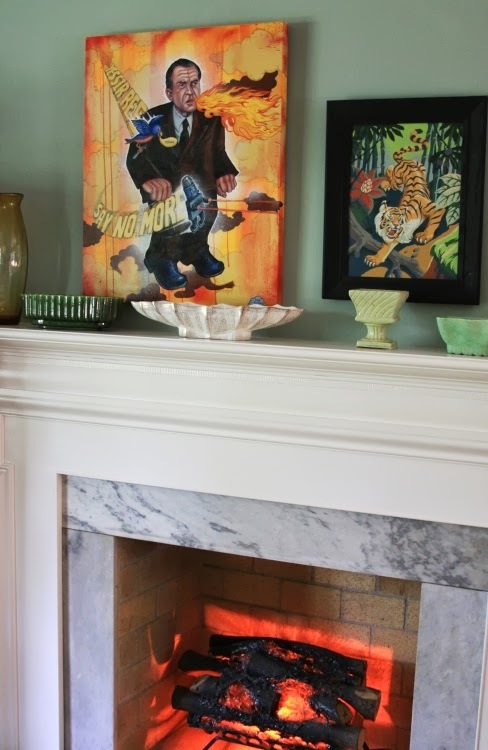 What Home Detail Inspires You the Most? Mostly the original details in our house. In my mind, it just screams for color to offset all of the original woodwork. 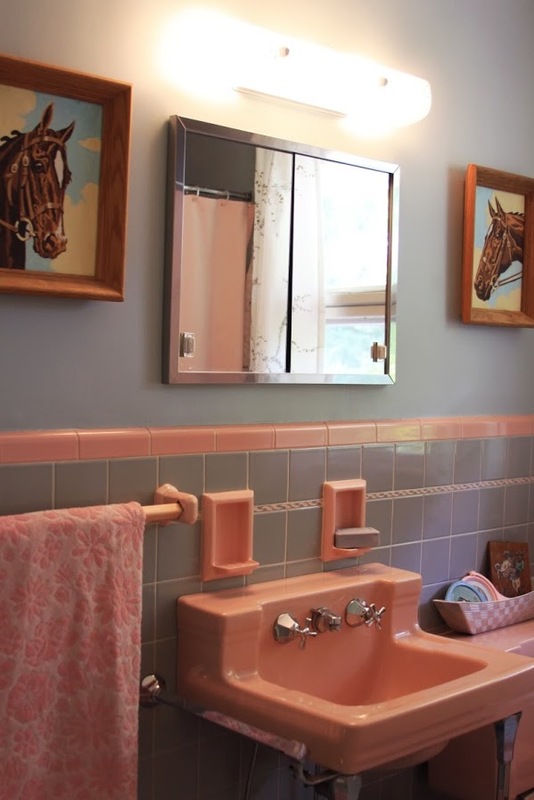 And you can't decorate too seriously when you have a bright pink bathroom and gaudy faux fireplace in the living room. Favorite Thrifted Find: Wow, that's hard! I'm guessing that at least ninety percent of everything that's in our house has come from thrift stores, estate sales and junk shops. My favorite find might currently be the old teacher's desk in my studio. Favorite Home Feature: The flagstone wall with lighted niches in the kitchen. When we saw that thing for the first time, I think I hugged it and the Mister just kind of gasped. It's all a blur but it's a *good* blur. Biggest Challenge: Finding contractors to retain and fix things in the house. Many of them just don't seem to get the fact that yes, we want to keep all of the old stuff. Yes, we DO realize that there is new stuff on the market but we don't want it. We've gone through quite a few bad apples before finding the good ones. We even had to force one guy off of our property! Vistor's Reactions: They usually either think that it's a really cool house - or say things like "you guys are funny!" Our house is beautiful to some and a prat fall to others. Biggest Embarrassment: Up until a year ago, we had a hole in the tile under the rug in the bathroom. 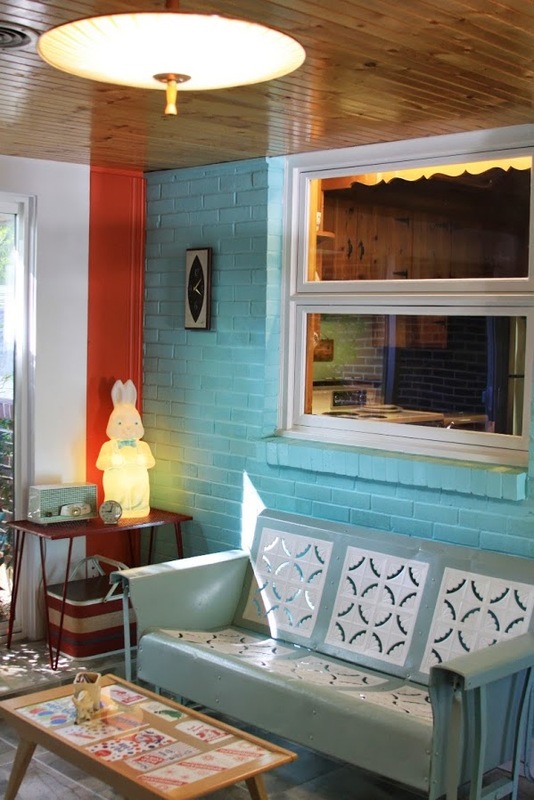 Proudest DIY: Repainting the entire inside of the house.His [my husband's] art degree helped on that front and thankfully he didn't snap when I kept trying to get this shade of aqua that could only be seen in my head. Biggest Indulgence: Painting the trim on the house. The painters were almost done with the whole house when we realized that we really hated the color. We hemmed and hawed on just leaving it but in the end, bit the bullet and paid them to start back at square one. The old color glowed in the dark - no joke. Best Money Saving Move: Lots and lots of research. We research everything down to the tiniest degree. It's good to know your stuff before a bad contractor comes in and tries to convince you of *his* stuff. Best Advice: Don't move into a house and instantly start changing things. Live there for a while and see what really truly needs to be changed. There will be things that will grow on you and you can save money in the end. You'll also see how your family's flow works in a house and what might need to be tweaked a little. Also, don't try to follow the norm. Even if your friends and family don't like your taste, it's YOUR taste. Go with it and go hard. And don't feel like you have to explain your taste to anyone. 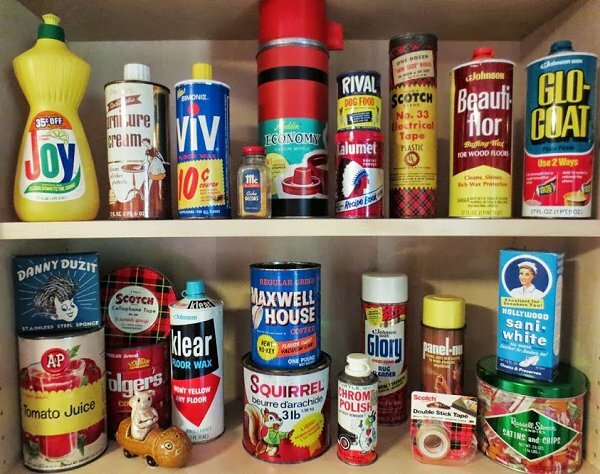 When people stare at my vintage floor wax collection with question marks in their eyes, I just put my hand over my heart and say, "I love that stuff." 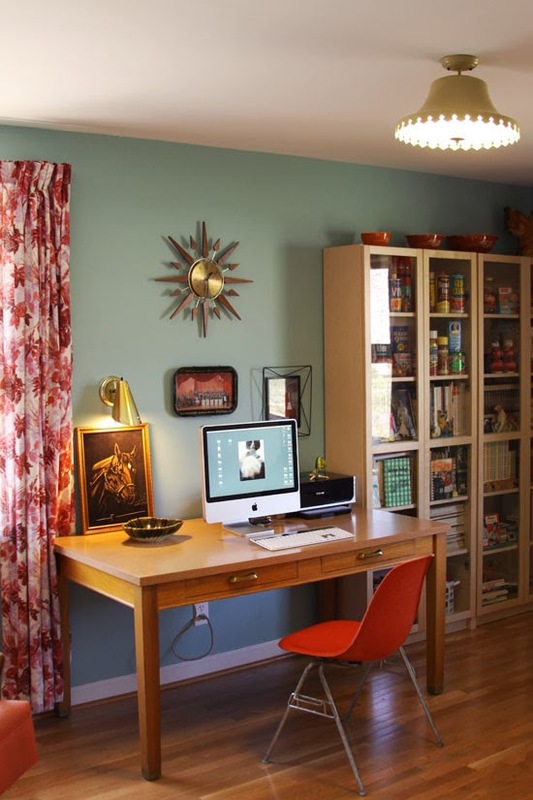 Van's Take-Aways: This Eartha Kitsch's Office is my Dream Space! I want it! Hell, I want the whole house! 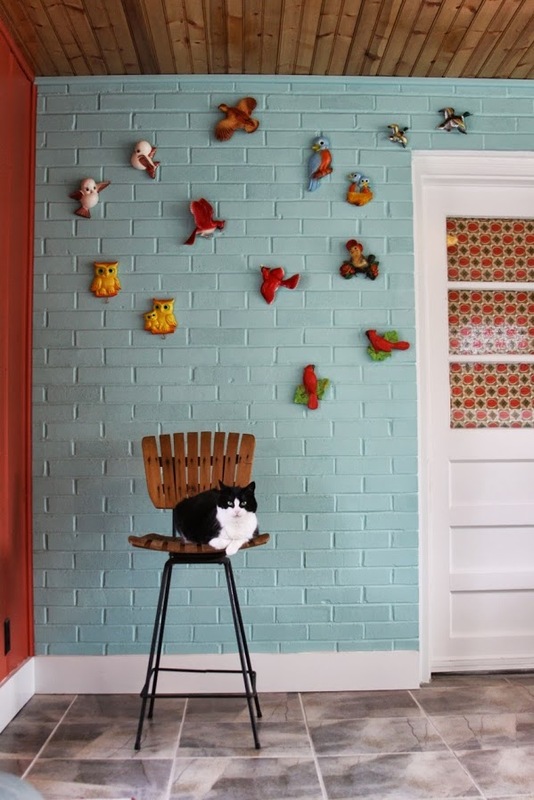 This house is full of fun details, yet streamlined. Goes to show you what patience, retraint, and sticking to a particular decade can do to make your home cohesive! I adore the displayed label collection, I'm a typography junkie, too. Check out Ranch Dressing with Eartha Kitsch,a hilarious kitsch-filled favorite! What's your favorite thing in the Kitsch Ranch? By the way, I need locals, readers, and bloggers to interview! 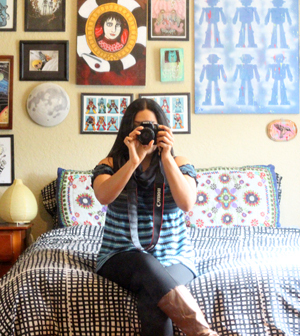 Send me an e-mail if you want to be featured on the next Thrifted Homes article. Oh this is the house of dreams! Thank you for sharing it. No problem. It had to be shared, too beautiful not to! Love it dearly. Saw a lot of items I have in my shop, too. I liked seeing stuff I've owned/sold before. I need to ask pet control questions on the next post. My Yuko has broken/damaged some of my good vintage, ain't gonna lie. We have 3 cats (have had up to 6 in the past) and have 5 big dogs. We are clearly insane. Keeping good vintage/antiques in our house is like giving those items a death sentence. Fortunately our shop is destructo-pet free. Haha, so awesome. Only willpower keeps me from having a mini animal ranch of my own! Keeping favorites out of the line of destructions is a good idea. :) Luckily Yuko has only damaged three things. They happened to be my most expensive (camera lens!!!) /favorite/important things, but still. I did indeed notice, note how it flows with even the blog design perfectly ;D If the house just had some more robot toys around it would look quite a lot like a space I'd arrange. Just visited their blog.... Love it too! Yes indeed, so inspired to work on my space and find some authentic mod furniture! 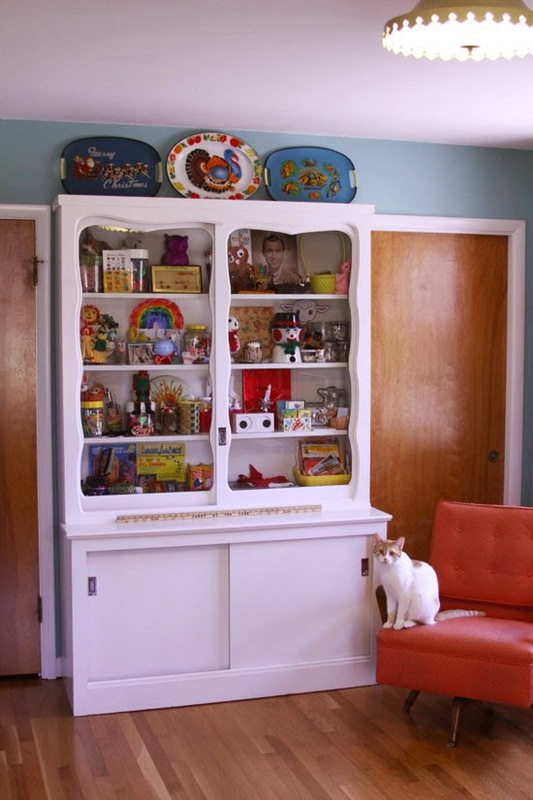 I need some display cabinets like hers to house my collections! ADORE Ms. Kitsch's home beyond words.......she is a fabulous designer and a lovely, lovely lady! Agreed on all counts :D ! What a perfect home! I love everything about it, especially that perfect aqua color! 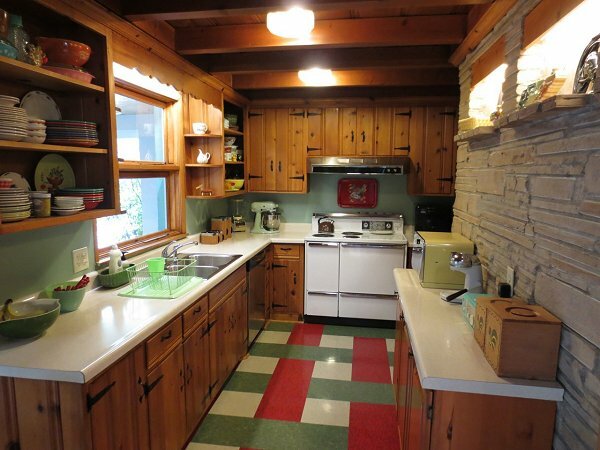 And their kitchen! And that white display cabinet! I could pretty much list everything here, so I'll stop. Their mid century clocks are amazing! I'm so jealous of the one over their desk! Beautiful house. It takes courage to stick to what you love when most people don't appreciate it. But who wants a house that looks like everyone else's, anyway? I display my weird crap with pride, after all, like you said, who wants a home anyone else could have? Noooot I. So awesome! I wish I could curate and photograph my collections that well! I have a feeling some people think the same thing about our house- they either get it or they think they're humoring us. I'm lucky that everyone seems to appreciate my weird nerd/toy/pop culture/vintage collections. 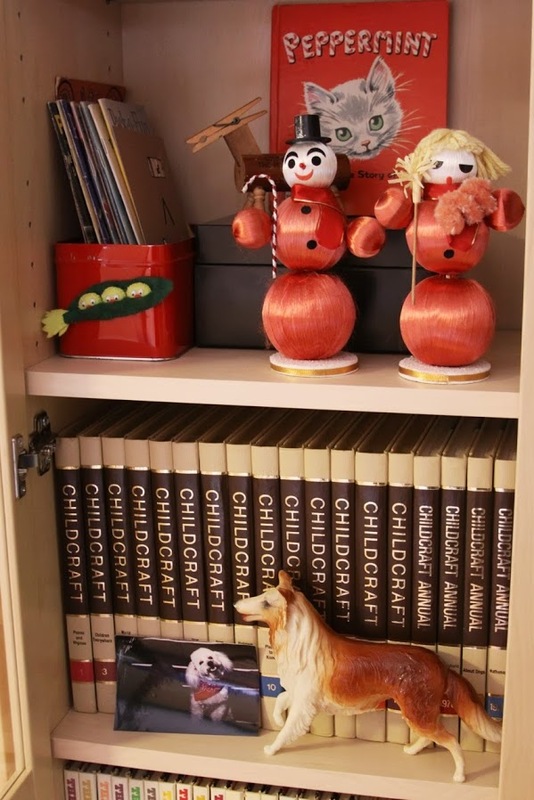 Her photos definitely have me wanting to streamline my collections, too! love love love. would pay to tour it! shade of aqua worth the effort. I purposely have vinyl furniture because I have dogs. She doesn't have any kids...think she'd adopt me?! I love her house! And to be frank I think she's the bees knees too! Cool feature Van! She is just the best. Love her style and sensibility and her ability to make us all laugh out loud in her posts! I could gush and gush about how much I admire and respect her! She is so generous and so kind! Thanks everyone sooooo much for your kind words! It means a lot to me! : ) Thanks again, Van for the interview. It was a blast and such fun to see the ranch on "Thrift Core". Can't wait to see the rest of the series! Ooooh...Myyyy....Gawdd!! 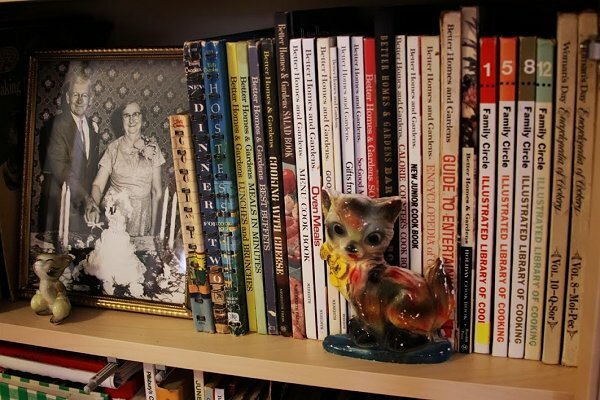 I follow Eartha too and seeing the inside of her domain makes me green with envy; it's amazingly fabulous!! Yes indeed it is! So inspired to find quality things for my abode! Gah! Perfection - everywhere you look! The Lawrence Welk TV tray, so many fond memories of dancing to Lawrence Welk when they played him on TV on Saturday nights. My grandfather, grandmother, sister & I would dance the night away, chips, pop. My grandmother is in a home, he plays Lawrence Welk for her all the time because he thinks it makes her feel good, he still talks about Saturday nights to us all the time. I saw a Lawrence Welk tray in Ohio & was so excited to find it. It was damaged, but I considered it because of the memories.. but the antique mall price was just too much. I'll hopefully find one again & get to display it with pride! I love the starburst table, too. oh my word this really spoke to me "They usually either think that it's a really cool house - or say things like "you guys are funny!" " That happens every time we have people over. I love Eartha's house. 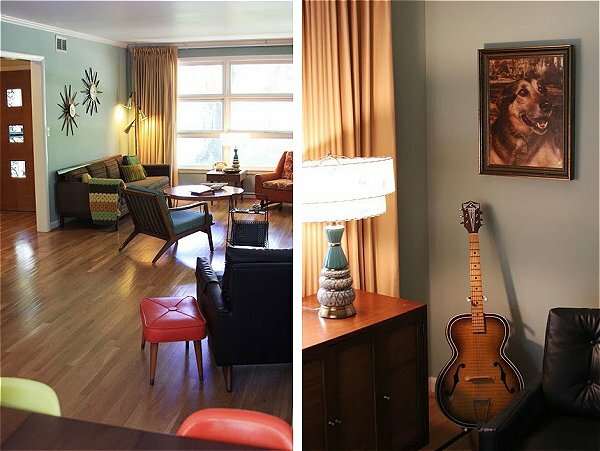 It is great that she has a lot of cool stuff but the rooms don't look cluttered at all! i need to figure that out in my own house! also, that beautiful dog portrait in the first set of photos! Eartha and I were at that sale together and I LOVED him but I don't have any wall space! I'm so happy he came home with her, what a sweet boy! I'm trying to remember his name, I feel like it was Luther. I'm lucky, I haven't have anyone come in thinking I'm weird or gross for my home choices, I get a lot of the same, "cool house" or "funny". 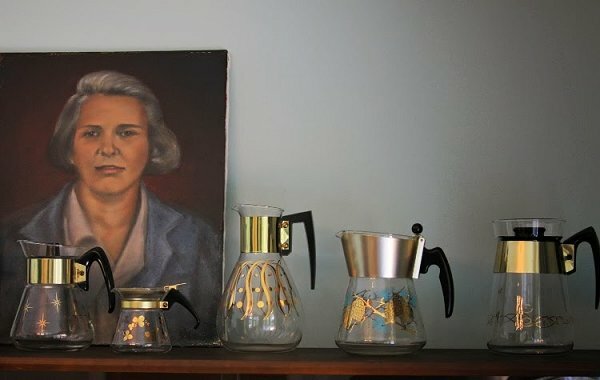 My mom thinks all mid century modern stuff is ugly but she still appreciates the whole picture. I so love this house! 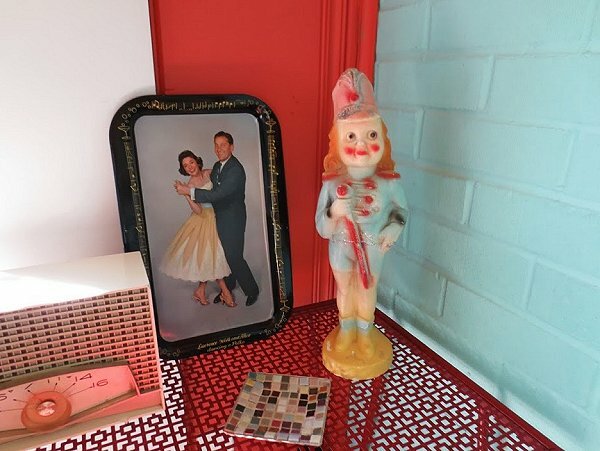 I love the color of the walls, and all the vintage/kitsch stuff makes it so personal and different from what you see on all those home decorating shows and magazines. Those vintage touches really add to the personality and charm of the home and really make it uniquely the owners' and not some professional decorator's. Thanks for sharing this with us! No problem, definitely agree with what you've said. It's personal and fun but clean, neat, and balanced enough to be in an "Atomic Ranch" magazine showcase. God, I love your house, Eartha! Every time I see it, it brings tears to my eyes!